It might be time to move on from blogspot. I spent 2 hours on this post (originally) only to have it delete itself. Here is a shorter version. Areas of increasing heights (and temperatures) are shown by the red arrows. Lowering heights are shown by blue arrows. These are troughs (blue) and ridges (red). This will help push temperatures into the low 50's today. Due to the stubborn Greenland block the front will take its time to clear the region. Precipitation will be done by Wednesday morning but the cold air will not work into New England until Wednesday night. Expect temperatures around 50 on Wednesday. By Thursday temperatures fall back into the upper 30's/low 40's which is normal for this time of year. Similar conditions expected for Friday. Here is the 9 day MSLP and 850 winds. This is 8 PM on March 20th. 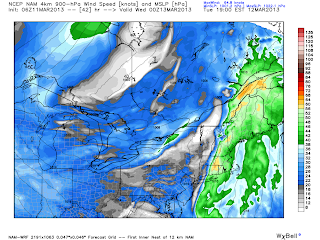 This would bring considerable snow, wind, rain, and coastal flooding/erosion. I don't want anymore snow but we can live with it. Its March afterall it will not stick around long. I'm concerned for the coast as another major ocean storm would be devastating. 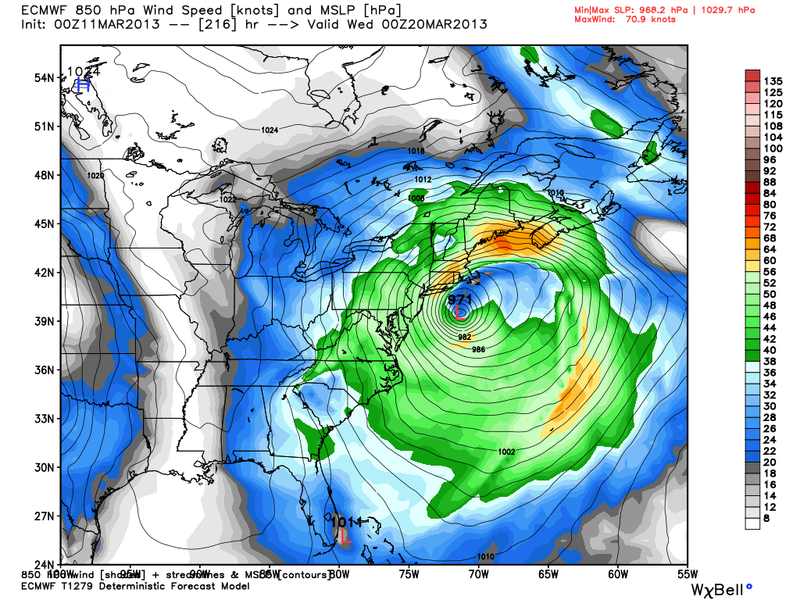 Is it irresponsible to talk about a storm 9-10 days out? 99/100 yes it is. Today I break the rule. If you live along the coast be aware there is the potential for another major hit. When people's homes are in danger of falling into the ocean I want to let them know as soon as possible. River flooding will need to be watched as well. There is plenty of time to watch this. Everyone wins if this blows out to sea.